by Sloane Crosley | Literature & Fiction | This book has not been rated. Kezia, Nathaniel, and Victor are reunited for the extravagant wedding of a college friend. Now at the tail end of their twenties, they arrive completely absorbed in their own lives—Kezia the second-in-command to a madwoman jewelry designer in Manhattan; Nathaniel, the former literary cool kid, selling his wares in Hollywood; and the Eeyore-esque Victor, just fired from a middling search engine. They soon slip back into old roles: Victor loves Kezia. Kezia loves Nathaniel. Nathaniel loves Nathaniel. In the midst of all this semi-merriment, Victor passes out in the mother of the groom’s bedroom. He wakes to her jovially slapping him across the face. Instead of a scolding, she offers Victor a story she’s never even told her son, about a valuable necklace that disappeared during the Nazi occupation of France. And so a madcap adventure is set into motion, one that leads Victor, Kezia, and Nathaniel from Miami to New York and L.A. to Paris and across France, until they converge at the estate of Guy de Maupassant, author of the classic short story The Necklace. 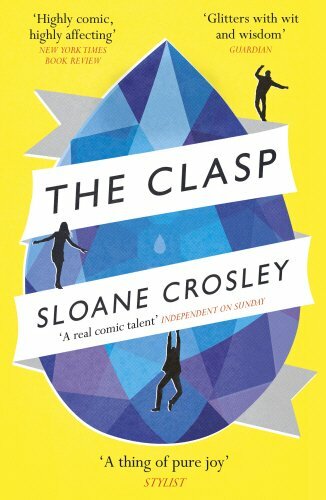 Heartfelt, suspenseful, and told with Sloane Crosley’s inimitable spark and wit, The Clasp is a story of friends struggling to fit together now that their lives haven’t gone as planned, of how to separate the real from the fake. Such a task might be possible when it comes to precious stones, but is far more difficult to pull off with humans. Go and make some new friends!